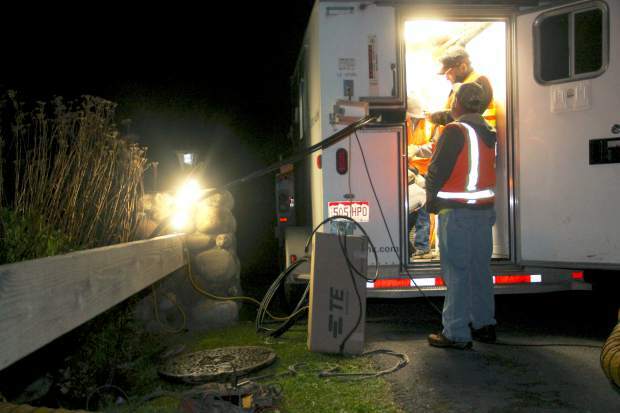 CenturyLink crews on the evening of May 26 assess damage to a fiberoptic cable near Ironbridge subdivsion. The incident caused widespread cell, landline and Internet outages in upper Roaring Fork Valley. Tuesday’s telecommunications outage, which began with the severing of a fiber-optic cable in Glenwood Springs, lasted nearly 19 hours, impacting 911, cell-phone, landline and Internet services between Carbondale and Aspen. According to CenturyLink’s regional spokeswoman Sara Spaulding, a third-party contractor damaged the cable around 5 p.m. Tuesday in the Ironbridge subdivision. Service was restored around 11:30 a.m. Wednesday, according to the Aspen Police Department. Both the police and the Pitkin County Sheriff’s Office resorted to knocking on doors in keeping the public informed about the emergency-line outage. Early Wednesday morning, officials set up a backup emergency line (309-1158), which was directed to a cellphone located within the dispatch center. Sheriff Joe DiSalvo said Wednesday that as far as he knows, there were no major emergencies during the outage. He said the only thing that might be considered emergent was a situation in Old Snowmass, where a car struck multiple dogs. “That person wasn’t able to call 911 but did get the message to us,” DiSalvo said. Spaulding said CenturyLink will be conducting an investigation into why and how the damage occurred. At this point, she said all the company knows for sure is that the contractor was laying conduit in the area. She declined to release the name of the contractor. During the outage the company relied on local law enforcement in communicating with its customers. Spaulding said that with cell and Internet service out, there was no other way to communicate. The outage also impacted Verizon wireless and Internet service. Regional spokeswoman Meagan Dorsch said the “fiber backhaul” was impacted. “We apologize for the inconvenience it caused our customers, and we tried to work as quickly as possible with CenturyLink to restore services,” Dorsch said. Spaulding said a repair crew worked through the night in locating the damage after digging equipment was transported from Silverthorne. Around 5 a.m., when the crew began splicing, it discovered further damage and began restoring service just before 10 a.m.
On Tuesday night sheriff’s deputies were deployed to outlying areas of the county, including Old Snowmass, Meredith and Redstone, and stationed at fire stations in case of emergencies in remote areas. Police also took to the streets to alert local business owners of the issue and to ensure they were able to contact emergency services, according to officials. The outage created minor glitches in the Pitkin Alert emergency notification system. Residents who signed up for multiple alert categories received repeat alerts in some cases as the system attempted to overcome technical challenges, according to a statement.